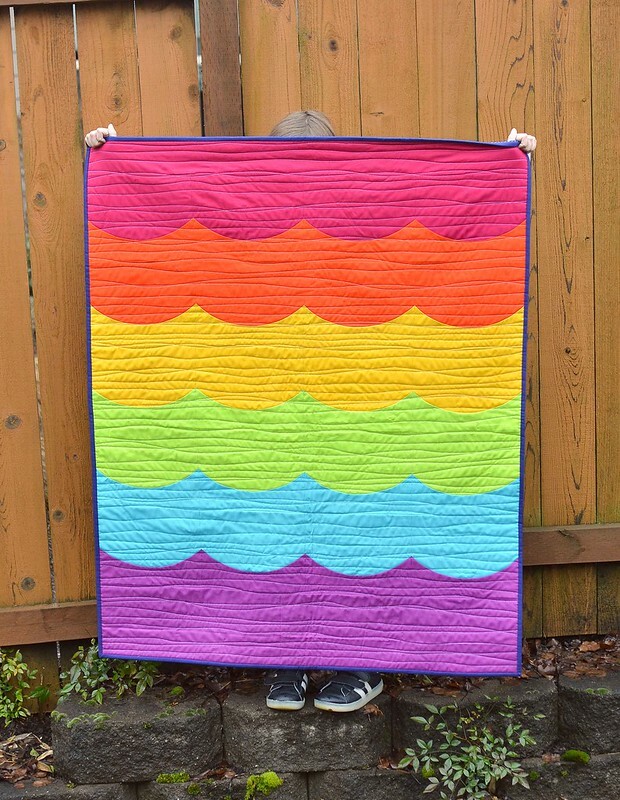 This quilt is available for sale in my shop! It's a little gloomy and gray here in Oregon and I was in the mood for something colorful. The colors on this one are not subtle - I may have gone a little overboard! It uses some of my favorite Kona colors: Sangria, Flame, Grellow, Chartreuse, Breakers, and Geranium. The binding is Kona Nightfall. The pattern is my Deep Blue Sea tutorial. 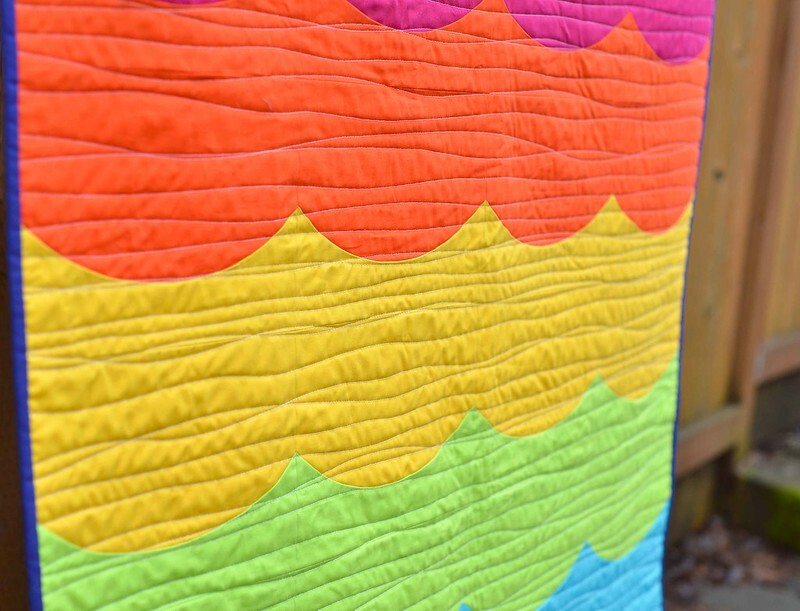 The curves on this quilt are gentle and it comes together quickly. I decided to quilt it using wavy lines. It gives the quilt a nice, crinkly texture. The colors on the front were inspired by the colors from this print. It is from Michael Miller's Flock collection. I have had it in my stash for a while, but it is still available. I might need to get some more. I sewed the binding down onto the back of the quilt with Perle cotton as is my usual lately. This is gorgeous! I love that backing fabric. This is beautiful! Love how it chases those gloomy days away :)! Oh, wow! Those colors are so RICH and BRIGHT! Yummy! The way you did the binding really caught my eye too. I have never seen anybody do it that way before. Do you machine stitch it down on one side and the do this hand stitching? Or does the hand stitching go all the way through to the other stide? It looks really cute! Oh, I love those colors! So bright and cheery. This is a beautiful quilt. I made a larger version of your Deep Blue Sea for my niece and she loves it. My husband cut the templates out of wood and it worked great. This turned out really awesome. Such profound color!! So cheerful and bright! I like that binding with the hand stitching. I like that binding treatment, too. Does it hold up over time? Perhaps you could do a post about it for those of us that are interested. 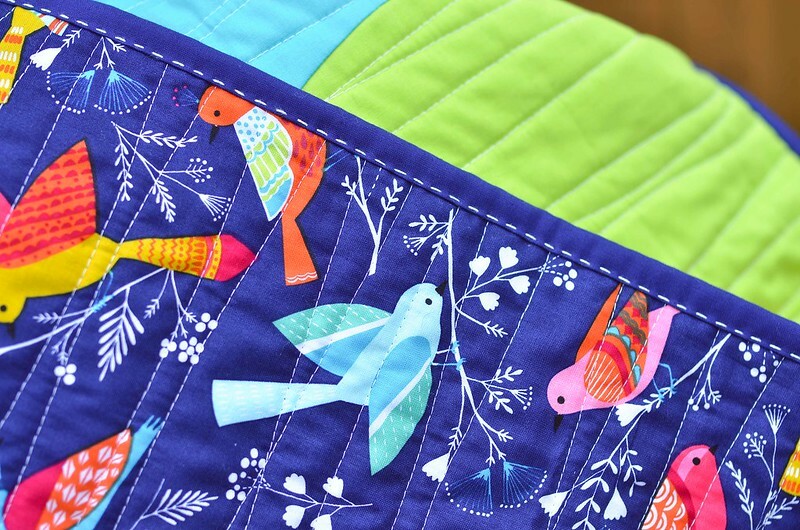 Love the colors and your quilting on this! Oh, and what a great binding technique! I'm going to have to look into this!! Love your backing fabric. In fact, I have some in my stash, too.